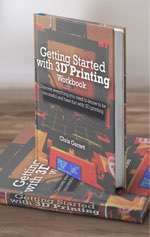 You are here: Home / Ideas, Strategies, and Advice / The Best 3D Printers – Which 3D Printer Should You Buy? In this final part of the series, we now need to answer the question many people ask when choosing a 3D printer; which 3D printer is best? I will share the best 3d printers for buying on a budget, the best 3d printer for beginners/class room use, and the best large format/prosumer 3d printers, to help you decide which 3d printer to buy for your particular situation. 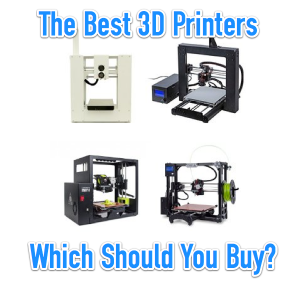 “Which 3D printer is best” all depends on your situation. What size prints do you need to make? What materials do you need to print? What is the intended purpose of these prints? How hands-on do you wish to be in building, configuring, upgrading and maintaining the printer? How important is real time customer service via telephone/chat/on-site, etc? Do you require extended warranty? Do you have specific software/compatibility/accessibility requirements? So I can’t say “buy this” regardless of your answers to the above, but people still ask. So with that in mind, for this final entry in the series I am going to list some ideas for 3D printers that match different uses. First, let’s look at entry-level printers on a budget. I’d say the most common question about which 3D printer to buy is which is the best cheap 3D printer. Knowing you might be compromising something, but still wanting to get the most bang for your 3D printing buck, it complicates things quite a lot, while also adding some fear of scams and, well, buying a lemon. December 2016 Addition – Due to popular demand, I created a whole new post for people looking for the ultra-budget $300 price point! Not to fear, there are a couple of suggestions that will work well, without breaking the bank! At $500 or under, the Wanhao Di3 is not just a good option as a budget 3D printer, it’s actually a great choice period. 200mm x 200mm heated bed. Metal frame. LCD screen. Amazing online community. Plenty of upgrades. Yes, there is a learning curve, but that learning curve is not just peculiar to this machine. It can be purchased from Amazon under the Wanhao brand (which is the model I have), or you can save a bit more and get the slightly older model branded as the Monoprice Maker Select. To get my complete thoughts on this printer, read my full review here. Both Anthony and Joel agreed with my choice here. I own the slightly larger Printrbot. I’m a big fan of the company (so much so I agreed to be an admin of the Printrbot Facebook group). Since becoming a fan of the company they released a new model that has excellent reviews. You do lose some printing capability, due to the small bed size, but it is only $400 , fully assembled. Rather than a heated bed (which you can add as an upgrade), it comes with auto bed levelling, which makes it easier to get up and running with quality prints. 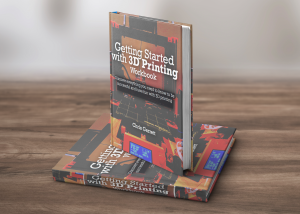 Beginners to 3D printing need to have an easier learning curve, more predictable results, good documentation and support, and as few doubts, uncertainties and frustrations as possible. Move to the classroom, that is even more important as there is only so much hands-on and supervision one person can do. Safety comes into play also. Which 3D printers meet those criteria? Again, the Printrbot Play is a good fit here. There are safety features, the lack of heated bed could be seen as an advantage in the classroom, print from an SD card untethered, and the auto levelling is a boon for predictability and not wanting to be constantly adjusting it in frustration. Plus, it’s only $400. This printer takes away a great deal of the frustration of owning and operating a 3D printer. The advanced level compensation doesn’t only take into account an unlevel bed but also skew in the frame. It has a legit E3D v6 hotend, and heated PEI surfaced bed (250mm x 210mm) that has no cold zones. You have a wizard-style callibration and self test, but you also get live Z adjust. This printer is a dream to set up and then it’s much more smooth sailing from there. 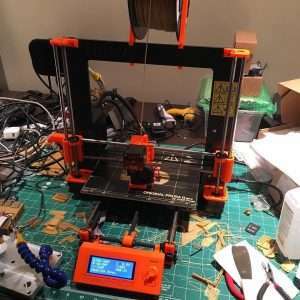 Check out my full Prusa Mk2 review here. At only $699 for the kit, or even $899 for the ready-made, it’s more affordable than the Lulzbot and, in some ways, more capable. Anthony went out of the box with his other suggestion here, going with a delta type 3D printer. Yes, it is very well thought of and a high quality bot once up and running, I would just worry about the additional learning curve and configuration that often comes with delta ownership. Worth taking a look, though! Once you leave the beginner or budget limitations, the sky is the limit for prices, and capabilities. In our suggestions here, we stick to what we know personally. Anthony, Joel and I all own Wombots, but Anthony now has the large format version. Joel loves his gMax gCreate printers. As mentioned above, James is sponsored by Lulzbot and uses his Lulzbot printers extensively. As the name suggests, the XL has a build area of 10″ x 10″, so on the starter end of “larger format”. Anthony has both XL and the new big guy, the Modus (build area is a much larger 400 x 400 x 500). The Modus is now available at $1,818 AUD + shipping. The Wombot XL is $920 on Amazon, including shipping from Australia. When I got mine the packaging was insufficient to say the least, but that has been somewhat corrected, looking at Joel’s recent unboxing. I found out today you should get the correct power cable for your country too, which also was a mistake originally. Another improvement included now on all newly built Wombots is all ABS parts (because our PLA parts warped and cracked due to heat), and a much improved bed levelling sensor (the BLT). Suffice to say, hopefully your Wombot will not have the frustrations I had with mine. At $3,000 these printers are not cheap, but as you can see in the video below, Joel loves his gMax printers and the capacity of these guys is huge. 16″ x 16″ bed. Huge! The Lulzbot comes in between the two printers above for both price point and for bed size at $2,200 and 11.7″ x 10.8″ respectively. James gets a lot of use out of his Taz collection, printing some amazing creations..
Creality CR-10 – Much less expensive than all the choices above, but with wonderful output, and almost fully built, the Creality CR-10 is amazing value for money, and the choice I would recommend heartily, as you can see in my CR-10 first look review video below. As you can tell, there is no one size fits all answer. We have done our best to suggest some ideas that will work for different uses, but only you can decide for yourself. I recommend copying the key 3D printer decision questions above and answering them, maybe send your answers to one of the Facebook groups or forums. Thank you to Anthony, James and Joel, for your suggestions and your videos.